Choose from over 60 classic flavors, and discover the rich taste and quality consistency in each and every DaVinci Gourmet product, including this classic orange syrup! DaVinci Gourmet flavoring syrups are made from pure cane sugar to complement your beverages without overpowering them or being too sweet. They are specially formulated to resist curdling in milk and to hold up well under heat, making them the perfect choice for espresso-based drinks, brewed coffee or tea, and more. We use this DaVinci syrup to make orange creamsicles and it is really really good. This is my preferred orange flavor for making ice cream. The sweet orange flavor you need for frozen or iced drinks. Color dirsnt stay strong for photos but the taste is great. Definitely a good buy. The classic orange fruit syrup is great and really has a nice citrus zing to it. A great syrup for making delish citrus base cocktails. Decent orange flavor all the way around. Subtle sweetness is here, but otherwise it's a well-rounded orange flavor that complements many different drinks. High quality flavor. Orange Italian Sodas are the closest you can come to a frozen ice cream bar covered in orange frozen ice. These at times are a top seller. A great classic orange flavor that is perfect for making unique coffee drinks. A nice way to switch it up and offer your customers some really great options. A great fresh tasting orange fruit syrup that makes a great holiday flavoring syrup. It is great for making cranberry orange cocktails and is very subtle. A nice buy. Orange flavored coffee is not my thing but this one is good in hot cocoas and hot or iced teas. It has a good orange flavor to it. 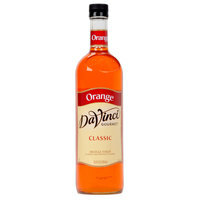 DaVinci's orange syrup has a great taste and is good quality. It's perfect for iced or hot tea, smoothies, Italian soda, etc. It's a great buy! Comes in a glass bottle which is great and preserves the flavor. Has an orange taste and makes a good soda but is lacking in the bite which is typically found in store bought sodas. I imagine because of lack of citric acid but that would be bad for coffee. An orange spice drink is so under-rated. Mix this with just a slight amount of nutmeg, cinammon, or even chai for a great drink! Highly recommended. I use this to flavor tea, not coffee. These flavorings are simple syrup with differnt types of flavors. Many of them are ideal for coffee, tea or where ever you'd like a little sweetness. Ideal to moisten cakes before frosting. This syrup makes the perfect Italian Soda and Orange Creme Milk Shake! Everyone always compliments the flavor of the drinks when I use DaVinci syrups!